The Government has secured 100 million dollars in loans to be used in giving a facelift to the Ghana Military Academy located in Teshie, a suburb of Accra, as well as constructing befitting housing facilities for military personnel across all garrisons of the Ghana Armed Forces (GAF). The Minister for Defence, Dominic Nitiwul, addressing officers and civilian staff of the Armed Forces at the General Headquarters 2018 WASSA, disclosed that he “through the support of President Akufo Addo”, laid in Parliament a loan of a hundred million dollars which he says will be used to “change the face” of the Ghana Military Academy at Teshie. The Minister further observed that part of the money “will be used to construct befitting housing facilities and accommodation for our troops, particularly, those of the other ranks across all the garrisons of the Ghana Armed Forces in Tamale, in Accra, in Secondi Takoradi, Sunyuni and in Kumasi”. 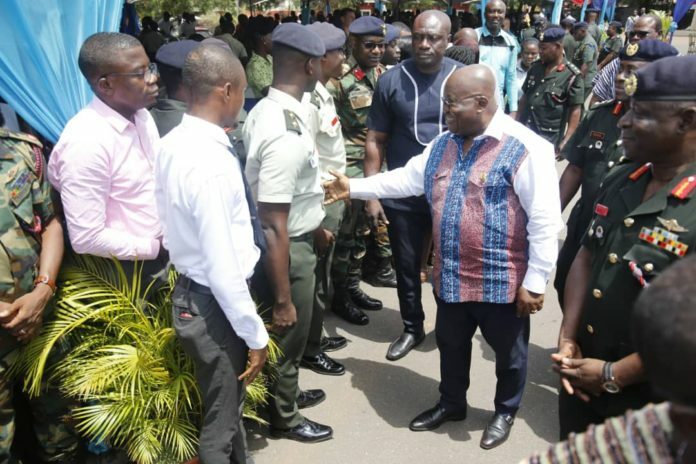 President Akufo Addo, who was the Special Guest of Honour at the 2018 WASSA, commended the Ghana Armed Forces for their tremendous performance in several operations they engaged in in the year 2018, such as Operation Vanguard, Calm Life, Halt and Rad Star. The President further indicated that government will continue to do all within its power to resource the Ghana Armed Forces with all of its needs and wants.